Exercise is hard work. Exercising regularly will help you burn calories, which may help you lose weight, but it will also use up the energy that your body has stored. You'll improve your stamina and will feel less tired after your workout if you eat a healthy breakfast that contains lean protein and carbohydrates before exercising. Talk to your doctor before changing your diet and exercise routine, especially if you have health concerns. 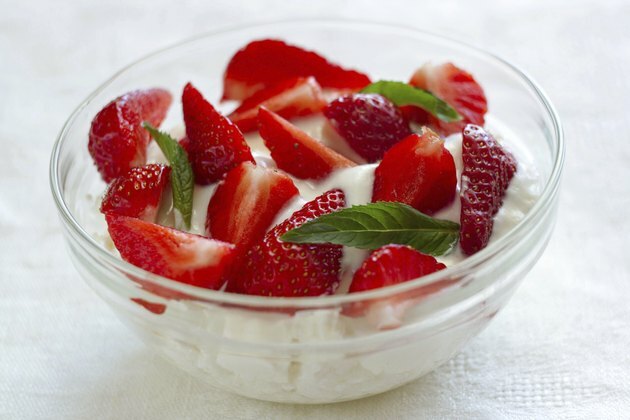 Add strawberries and sunflower seed to fat-free yogurt and eat it about one hour before you exercise. Both fat-free yogurt and sunflower seeds are sources of lean protein. Although your snack only contains 214 calories, it has 10 grams of protein per serving. The small meal contains 40 grams of carbohydrates, which will provide an immediate burst of energy that will help fuel your workout. If you can't find fresh strawberries, thaw a few frozen strawberries and add them to the yogurt. Oatmeal is a whole grain, which means it will keep your blood sugar stable during your workout. Eating a cup of oatmeal about an hour before your workout will keep you full, even when you're burning calories. 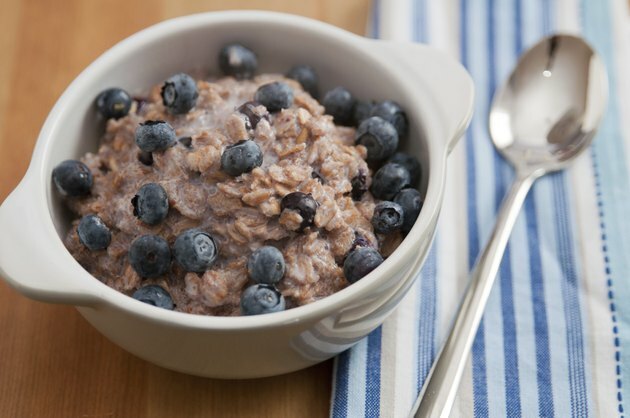 Add a handful of blueberries or another type off fruit to the oatmeal to add more carbohydrates to your snack. Fruit contains glucose, which will provide a fast burst of energy, while oatmeal will provide the glycogen that improves your stamina. Spread a small spoonful of low-fat peanut butter on a piece of whole-wheat pita bread and add thin slices of apple on top. Peanut butter is a lean protein source that will keep your energy level up. Regular peanut butter is high in fat, and eating too much of it may make you feel tired and sluggish before your workout. 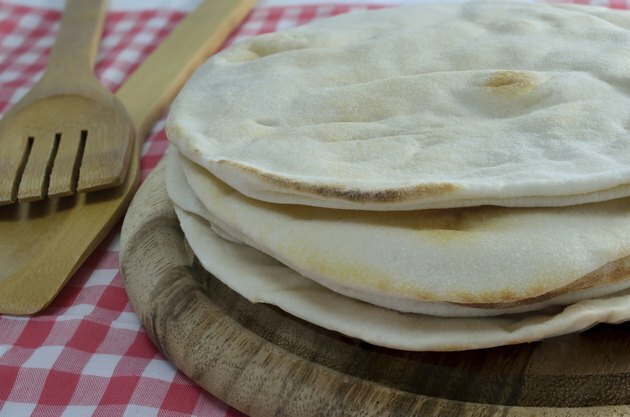 Instead, eat a small amount of low-fat peanut butter and combine it with complex carbohydrates, like whole-wheat pita bread. An apple will provide you with quick energy that will jump start your workout. If you're not a big breakfast person but you know you'll be working out for more than an hour, eat a banana -- preferably about 15 minutes before you exercise. A banana contains complex carbohydrates that will keep you energized without filling you up and making you feel sick. 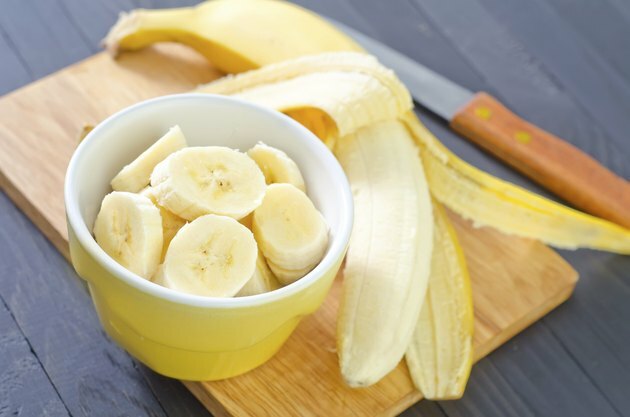 To keep your blood sugar levels up while you exercise, eat tiny chunks of banana while you are exercising. This way, you can keep your energy stabilized without feeling overly full. Health Services at Columbia: Is it Better to Eat Before or After Exercise?